MuscleNerd dan iPhone Dev Team sudah mengkonfirmasi bahwa Firmware 2.2 sudah bisa di unlocked. Saat ini yellowsn0w akan dirilis dalam waktu dekat ini dan untuk menggunakannya iPhone harus dalam keadaan jailbreak dengan terpasang Cydia karena yellowsn0w akan tersedia melalui Cydia. 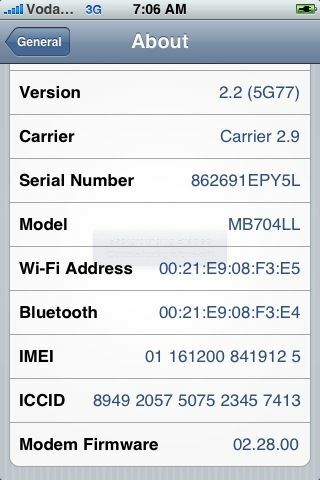 Entri ini ditulis di iPhone dan ber-tag 3g, iPhone, soft, unlock pada Januari 1, 2009 oleh orakanggo. GOLDEN RULE: If you have a 3G iPhone and want potential soft unlock in the near future do NOT use QuickPwn, and do not use the official ipsw or the iTunes update process without using PwnageTool. Read item 1 again and again. At the bottom of this post are the bittorrent files for the latest versions of PwnageTool and QuickPwn. These are suitable for the recent 2.2 release. Choosing the correct tool is crucial. Be warned! Entri ini ditulis di iPhone dan ber-tag 3g, iphone 3g, jailbreak, pwnage, pwnage tools, unlock pada November 24, 2008 oleh orakanggo.